Yoga is a practice of turning inward or pratyahara (withdrawal of the senses). It can be hard to do this at times in a more rigorous yoga class, especially for those still learning the poses and therefore needing to fix their focus to others in the room in an effort to get their bodies into the right position. Restorative yoga allows us the space to hold poses for longer, with the support of props, so that we don’t have to use physical effort to do so. Our bodies experience the benefits that come from a backbend or twist, but we are not asked to tighten our muscular grip. The addition of props becomes physically therapeutic when their use is to position the body into good, healthy and natural alignment (for example using a strap, block and blanket in a constructive rest pose to re-set the pelvis). Holding poses for longer allows the nervous system to slow down, our minds to relax, and creates greater space for the mind to quiet. Yoga chitta vritti nirodha. Yoga is the cessation of the fluctuations of the mind. The challenge here is that when we first quiet our physical bodies, before inner peace, a flood of thoughts often come rushing in. And if we are going through something emotionally painful or stressful at this time, the influx of thoughts may feel unbearable. Has this ever happened to you? If so, you’re not alone. One moment you’re peacefully lowering yourself into supported reclined bound angle pose, and the next you’re in tears and with shaky sweaty palms. further panic ensues as you’re flooded with thoughts of what to do next. You want to run and escape from this mental place as soon as possible, but your fears of disrupting other students, of them knowing you’re emotionally overwhelmed, or not wanting to upset the teacher pour in and you approach full-blown panic. Know that you’re not alone. This is a natural way of the body when we are quieting ourselves. It is unlikely that your teacher will be upset with you for leaving if you feel you must. Even though your instinct is to flee, staying in the class is often a beneficial option, if you can. Training your body to tolerate temporarily intense feelings is beneficial across many contexts and a yoga class is a safe space to practice just that. There are some poses that excite us and extend our energy outward and others that naturally offer a more introspective tone. Changing the type of pose you’re in can have the same effect as actually changing your physical location. If you’re in a backbend, come to a forward bend or twist. If you’re in a forward bend switch to a backbend or twist. The teacher will not be upset that you’re adjusting- it’s likely that the teacher will approach you to see if everything is alright and from here the teacher can offer you an option for a different pose if you aren’t coming up with one on your own. Keep your eyes open and use grounding. Grounding offers many of the same benefits as meditation, except that rather than turning inward, as we do in a meditation practice, we are focusing on our external environment and physical bodies. When our minds are flooded and racing, turning inward is the last thing we need. Turning outward and grounding first is helpful. Focus on sounds: Notice the sounds you hear in the room. Pinpoint all the different sounds you hear – maybe you can hear cars on the street, the sound of your teacher’s voice and the relaxing music playing in the background. Notice all of this. Then ask yourself which sound is the loudest, which sound is the next loudest, etc. Next, notice which sounds is drawn out the longest versus which is shorter or unsteady. Next, you might observe, which sound is the most soothing or pleasant and choose to keep your focus on that sound. Continue to focus on this sound as you breathe. Focus on your outer body in comparison to the other elements in the room. Here we might notice for example the tops of our feet on the ground/yoga mat if we’re in child’s pose. We would notice the way the tops of our feet feel against the ground. We might ask ourselves, which is harder the ground/yoga mat or the bones at the top of our feet? We might ask ourselves which feels warmer, the ground/yoga mat or the tops of our feet? We could notice what else we can feel. Maybe our knees are on a blanket. We might ask ourselves, which feels softer, the blanket or my knees? This answer might seem obvious but the goal is to distract our minds from the overwhelming emotions until they pass. We could then ask ourselves, which feels warmer, the blanket under our knees or our knees themselves? Which feels warmer, the blanket under our knees or the ground/yoga mat under our feet? It is likely that after spending time grounding your mind will have softened and your body relaxed and you’ll feel ready to join the class in the next pose. It’s always good to practice and learn grounding when you’re in a calm state. So go ahead and give these exercises a try. You can experience their benefit even when you’re not agitated or overwhelmed. Learning how to tolerate upsetting emotions is a step on the path to peace. As it’s stated in the Bhagavad Gita, Yoga is the practice of tolerating the consequences of being yourself. We are good people and we all have “stuff” that comes up. It makes us human. Let’s embrace it and move forward, we deserve it. 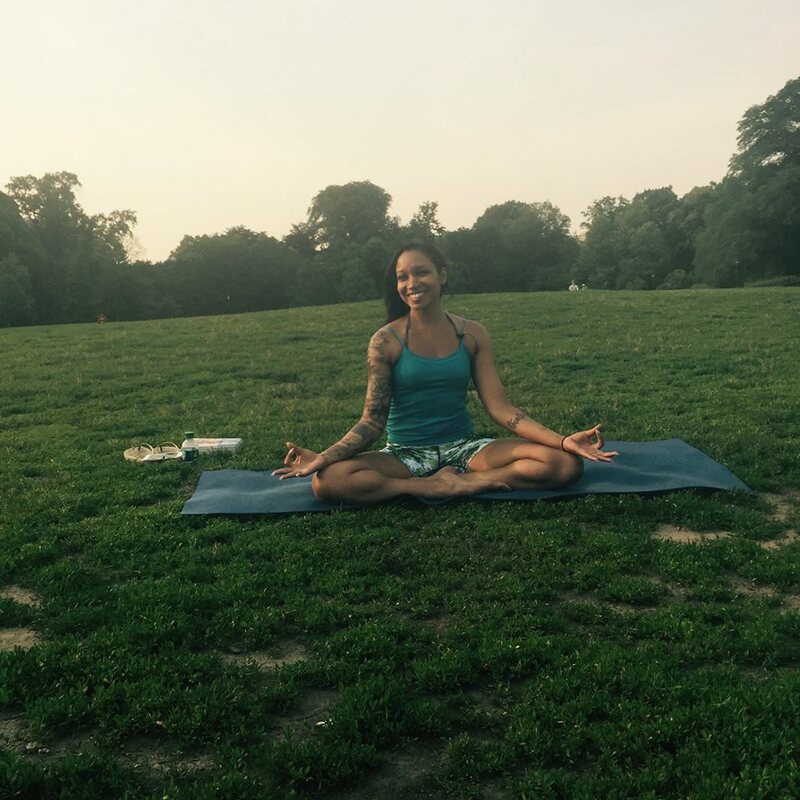 Nityda Bhakti is a New York City based vinyasa and restorative yoga teacher for almost a decade and licensed psychotherapist in the state of New York. Nityda created The Yoga Wellness Space as a means to help make beginning a yoga practice feel less intimidating and sustaining a practice easy and fun. Combining her expertise as yoga teacher and mental health professional, Nityda developed Yoga Heal®, a method of yoga therapy that combines components of talk therapy with the restorative yoga practice. Nityda is super excited to be presenting at the Yoga Service Conference at Omega Institute this coming May 2016. Visit Nityda at www.TheYogaWellnessSpace.com for more info and check out her free yoga videos on YouTube at www.youtube.com/nityda.